A Sun bow reflected down off of the clouds! An anomaly I'd never heard told. Have you? An unusual sunbeam or a one colored bow to the ground opposite the sunrise! Believe me, the man without a camera, it was wild to see! The eastern sunrise was clouded completely but trying to burn thru all orange like. Rain had fallen lightly on the 17 mile trip to this point. The low cottony cloud's ceiling may have been 15,000 feet. A guess as to how wide would be 500 to 700 feet. 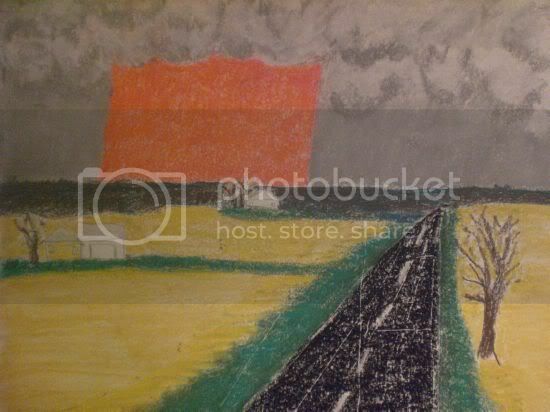 I was going West and there was an all orange high degree of an arch to the left.........rainbow ? Down from the clouds to the hills slightly southwest of my direction. I looked hard for other colors and only viewed this January bow, ONLY ORANGE for sure, for about six miles. There was no "other end" to view looking northeast. Sunlight across the top of the clouds. And a reflection with a slight arch to the ground. As I turned West again after a 2nd curve on a northward heading it went away very quickly with the cloud's movement causing this fade I'm sure! Eastbound commuters may have missed this strange sight. Has anyone here seen an ALL ORANGE bow with an extreme arch? Unlike anything I'd ever seen before. Let alone the color seen that morning after a very long night. Normaly I would have been home a few hours before this 7:20 AM sighting! 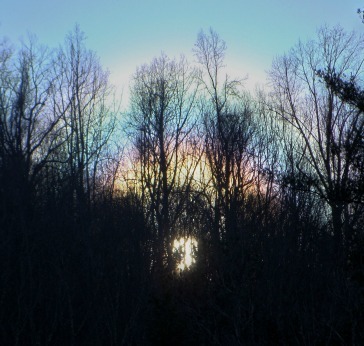 Have you experienced a sunbeam cloud deflection like this? There had to have been literaly hundreds of commuter witness' who could have viewed this sunlight anomaly. All traveling North and South on the Dixie Bee Line. That is The Almann Brother's band's highway mention in "Ramblin Man." A USA rock n roll song hit in the 70's. It is US Highway 41. I've never seen one before. Wish there was a picture to see. I've seen pics of beautiful orange rainbows and even red rainbows online but never saw one in person. Maybe someday I'll get lucky like you. Empress Star, A picture for sure, but Silent One's first link is pretty close. The one seen was wide and steep for the angle. Wide as in a half of a playing card at arms length. The touch down, as a guess, was either four miles away or as much as twice that, who knows. Again with no hint of other colors. Silent One the second link did not go. Maybe I'll try again in the morning. It makes one feel quite blessed to have seen what the commuters surely viewed that morning. Thank you for the posts n pinions! Rare for me jesspy. I hope more can account similar experiences for this orange bow. What in clouds would be a good mirror facing down? I think water vapor would not do this. I've heard silicate particles from air pollution will reflect sunlight back up. As the experts relate that to the warming so bantered about. And the questions remain wide open to all. Answers too I hope. I am not sure what area you saw this or if what I saw might be the same. On March 4th, at 7:51 am, here in Portland, Oregon, I saw something pretty shining above this mountain nearby my home. I ran outside and started video taping it at 7:53 am. It was just so cool looking. I've lived here all my life, and never seen this before. It was pretty cool. I tried to show where the sun was compared to where this glow was in the images I collected from the video. The video / images do not give it justice.. it was really pretty to see with the naked eyes. We're off to Outback for an Aussie meal. A sun dog there? Anyone else? We're baaaack! Thanks friend and there is an Outback near you. Not Austrailian; just a Hoosier with spell check problems as left over in your "quote". It's not a good thing to type with out my reading glasses. I bet America's Southwesterners would call your nice video the "Sun Dog" from Native American natural earth legends. We're off to Outback for an Assuie meal. A sun dog there? Anyone else? Ohhh... you must be in Australia?? I'm not sure what it was that I saw but I've never seen this sort of glow here before. It was really odd.. how it stood out and well above the light fog that was on Mt. Scott there. Anyway, I have converted this 5 minute video to NO AUDIO -- I sound so stupid on it! Cool! I saw something just like that before except the sky wasn't overcast and the rainbow colors were reflecting off one of the only small clouds in the sky. Sure Cinders, when you get time we will wait for it here. The flash pictures were great and you did show where the sun's location was compared to the sun dog. I think sun dogs are incomplete rainbows or a rainbow trying to get started too high in the clouds. I hope my thread garners more member's ideas on rainbows, sun dogs, and sun bows. It was a Kodak moment I should have missed. As I usualy get home an hour before daylight. I used my reading glasses to type this and I did not murder any word's spelling. Ha! Ha! I uploaded the with NO AUDIO -- like I said I sounded silly for that time of the morning. The hill you see there underneath this huge glow is where on one side is the Willamette National Cemetery. The other side of it is Lincoln Memorial Cemetery. There are also homes and a few radio towers at the top of Mt Scott there -- to give you an idea just how huge that pretty glow was. It was so much prettier than what I could capture on this video.. I had viewed your video of a possible Sun dog with the Sun in perspective to the left. I ran off to the MACK and forgot to respond to your great contribution here. My appologies my friend so far away. Everyone I've told about my pictureless Sun Bow are still mulling it over. You would too. Everyone would. It was very cool to see. Why was it all orange with no hues of other colors? How could water vapor reflect sunlight? MK, I was wondering if you got a chance to see the Google map and my "silent" video along with still shot images of that strange pretty glow here. Glad to read you saw it.. I always carry one in my purse for when I am out and about. And when I am at home I have my DV Camcorder charged and ready to go at all times. I wish I could have seen what you saw... sounds beautiful. It really started out a gorgeous day here (67F!) then it got cloudy.... then....a RAINBOW On St. Patrick's Day !!! First a Crow, then a Plane, then a RAINBOW! THEN I snipped and edited the 3 videos (over 4 GIG) to create this FLV video with RIVA (also free) of only 16 megs! No pot of gold, but it was a lovely St Patrick's day in Portland, Oregon! Our sighting, there had to be many "viewing" commuters, was a very steep angle. A bit like the dark line of your house on the right side of your posted rainbow filmed on St. Patrick's Day. That wide Sun streak was not really a bow shape. Just the hint of a bend to the left on the horizon. All orange and how could this be? It was like a mirror was just above the clouds! Come on folks and open up with us! Opinions are needed here too! What you saw was a particle beam...does it match the picture? It just dawned on me returning here after such along time away. I could go into my profile and view where I had posted this sunlight anomaly. Thanks for the great pics and I am appologizing for being two years late was it? I am astounded at the view counts!! Very ! Nope your nice entries are not like what I saw in January 2006. Imagine an "all dark orange" playing card, slightly angled left, the length of your pc's screen, well left of center. "A camera! A camera! My Kingdom for a camera!" This was something to catch in each one of our lifetimes. I will be very pleased if one of the members here IS ABLE to post a pic of the exact sunlight reflected anomaly. I just re-read my old post and this line actually threw me a loop. Maybe it did you too. From page 1 at the top. "Has anyone here seen an ALL ORANGE bow with an extreme arch?" I didn't even realize that rainbows could be just orange or red. You learn something everyday. I like when at night there is a glowing ring around the moon, but that's a different subject. I know you are familiar with the Dixe Bee Line made more famous by The Almann Brothers mentioning Highway 41. It runs through Chicago for sure. A few Chicagoans may have viewed this anomaly if they were traveling south that morning at Fort Branch, Indiana. I wanted to call this a better name but when you see something like that shocker, there is no name for it. We have a brand new copier still in the box. My son is willing to make a watercolor picture from my memory. When it's done I will have him post it here PDQ! Especially since this old thread got renewed from the dark pages and now it's back to page one thanks to you! This sunlight anomaly might just be a 'sunband'. But hey! I doubt there is a name for it anyway. Like Frogfish said maybe this was a particle beam. That is a pretty commonly used name. This could be a common sighting just new to me. If any interested member would like to place the web sites cloud formation here, please do so. My son has shown me how to do that, but I always forget how. Now this long gone sunrise anomaly has over 5K views! Wow! Everyone, this is what I saw, it's finally here. As drawn by me and colored by my son. I've seen a sunbow. They are real, but yours does not look like a sunbow. It is even more mysterious! Thanks to aurora333 for moving this sun anomaly back to page 1! The dark pages on any paranormal forum are the pits. The colored art work in chalk is behind me and framed under glass on the wall. I appreciate you saying, "It is even more mysterious!" I just checked your pic to see if it will enlarge and the little "white hand" showed that it will. Thanks for your sunbow pic so strange! Post it at UM under Natural World for everyone to see. I don't get e-mailed notices of action, but all these years I do have UM keyed to send mail. I still hope some UM members or Guests will have seen the same view of a rising Ole Sol reflecting a solid dark orange wide beam downwards on the opposite horizon! The "sun pillar" art between Ft. Branch and Owensville, Indiana was posted on October 31, 2009. There are well over 11,531 views and I thank everyone that came in here long afterwards. aurora333 is now credited for a nice note about my last post & artwork 3.5 years later. 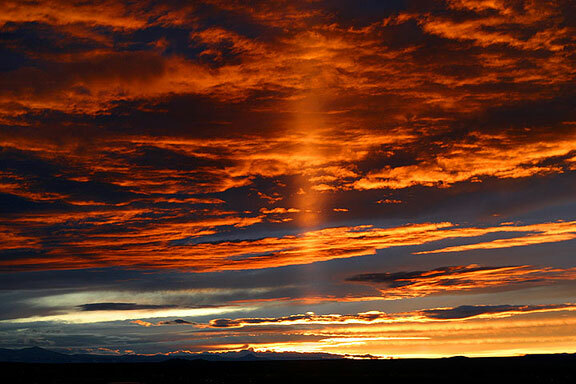 That Natural World viewing was seared into my mind as my one and only sun pillar so mysterious! P.S. Tune in now to Coast to Coast AM with John B. Wells as they chat up geoengineering via chem trails, weather control and Monsanto! "What In The World Are They Spraying?" with Michael Murphy! Someone is trying to make planet earth an unnatural world! Watch out for Agenda 21! Edited shortly afterwards: aurora333 your sunbow pic is just as mysterious and your catch on film was a first view by me, ever! Thanks! October 5, 2018 - Our Photo Bucket pic is being attempted again. If this post does not show the sun pillar I viewed with wide eyes in January of 2006. I am asking any Moderator to please delete this post so this can R.I.P. in the well viewed Dark Pages. No luck! In time our son will be able to put it back in for me and a deletion of this action is A-OK. I'll be back! ........but if a Moderator can put it in here I would appreciate it. I tried following the "Drag files to attach" instructions below this edit, but the box just blinked a pinkish no go. USA copy and paste tried without any paste! LOL Max total six size of 0.24MB so my pic must be too large.